William Morrow Paperbacks, 9780061706295, 352pp. 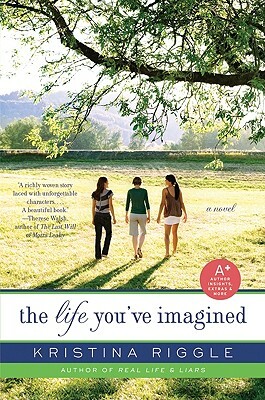 From Kristina Riggle, author of the brilliant debut Real Life & Liars, comes The Life You’ve Imagined, an astonishing new novel about love, loss, life, and hope. It’s the story of four former high school friends who are forced to examine what happened to their high school dreams which are now at odds with their grown-up reality. Riggle, author of Real Life and Liars (2009), explores what happens when real life diverges sharply from childhood dreams. Her strong and complicated female characters are interesting and likable, and she ably weaves together multiple story lines. Why do you think Maeve has failed to move on from the store and her marriage? Have you ever felt stuck in the past like Maeve? Were you able to move on? What did you do to get "out of the rut?" Why do you think there's friction between Maeve and Anna? What kinds of issues complicate relationships between mothers and grown daughters? Anna and Beck feel drawn to each other after years apart, and Maeve still pines for her estranged husband, Robert. Do you think old romances can ever come back to life? In continuation of the above question, do you think old romances should ever be revived? Why or why not? How does the absence of Anna's father during her childhood affect her adult life? Did his absence have any positive effects on Anna? What were they? Does a person's past irrevocably color her future? Why do you think Cami comes back to her dad's house despite their history? Have you ever known anyone to remain in a dangerous, abusive situation though it seems obvious they should leave? Why do you think this happens? Amy always strives to control every aspect of her life. Think about this personality trait in terms of her dramatic weight loss: are the two related in some way? What other ways does she try to exact control? Are these actions to her benefit, or detriment? Have you ever made a dramatic, yet positive change to your life, such like Amy made? Were there unexpected downsides to this transition? Why did they arise, do you think? Anna's decision to remain open to the idea of contacting her estranged father. What would you do if you were in Anna's shoes? How did you imagine your life when you were younger? How much is it similar to what you predicted, and is this good or bad? If your life has not turned out the way you wanted it, is it defeatist—or realistic—to accept it? The author chose a quote from Thoreau as an epigraph for the novel: "Go confidently in the direction of your dreams, live the life you've imagined." Why do you think she chose this particular quote? What does it mean to you, in light of what happens in the novel? Consider the novel's four main female characters. Is there one that you identify with? Which one, and why? When you first read the novel's title, what did you think the story was going to be about? What does the phrase "The Life You've Imagined" mean to you?